Sustainable green technology by way of transforming agriculture wastes or biomass into bio-char through a microwave system. 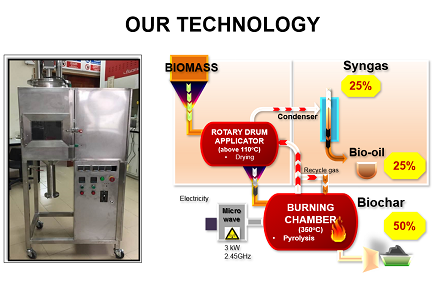 Compared to the conventional method, this Biomass Microwave Carbonizer (BMC) innovation offers an innovative and clean technology using microwave-assisted pyrolysis (absence of oxygen) 50 percent of faster burning and 63 percent of energy consumption as well as 70 percent of less carbon emission. It will benefit various industries in the on-going efforts to minimize greenhouse pollution and dependence on less sustainable sources. Prof. Dr. Azni Idris who led the research said the traditional process of making bio-char was time-consuming and involved high smoke emission. “But through BMC technology, the process of making bio-char will be cleaner and production could be doubled within one hour, with better quality products,” he said. According to him, the burning process using BMC technology and pyrolysis method could take place in a well-balanced burning chamber under low heat temperature (250-300°C), with a controllable and adjustable automatic panel to optimize the temperature to achieve the highest ratio of biochar production as high as 50 percent conversion. The bio-char product will be produced after one hour of burning. He added that BMC technology provides the best performance compared to existing alternatives – incineration and conventional pyrolysis – and gives better results on process control and heating time with a ratiio of 30 percent more efficient and 90 percent of cleaner burning. Its target consumers are sectors that use inflammable sources as their heating source, boiler systems in factories, F&B sector such as catering, restaurants, hotels and retailers for the application of barbeque. This BMC system can also be applied to the plantation industry such as palm oil, paddy, kenaf, bamboo and landscape residues. He also said one significant impact from adopting this BMC system was that biomass wastes of 20 million tonne metric per year could have the potential to add value to factory products worth 1.4 million tonne yearly. 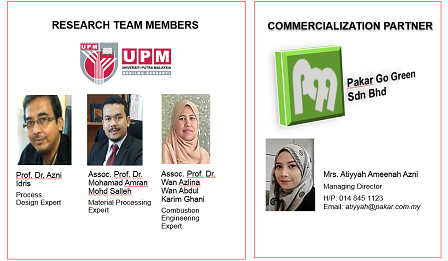 The research which commenced in 2012 was conducted with the collaboration of Pakar Management Technology (M) Sdn Bhd, and commercialized by Pakar Go Green Sdn Bhd, with the grants financed by Platcom Ventures Sdn Bhd and Higher Education Ministry. The market price for BMC technology which has the capacity of producing 5kg per hour is RM50,000 and RM1 million for those with the capacity of producing 500kg per hour, while the retail prize for briquette bio-char is between RM3 and RM10 per kilogramme, depending on the types of raw materials. – UPM. Ministry Of Agriculture & Agro-Based Industry Malaysia.